Chandigarh, though one of the relatively new cities of India, impresses the visitors with its host of tourist attractions. Explore the places to see in Chandigarh. 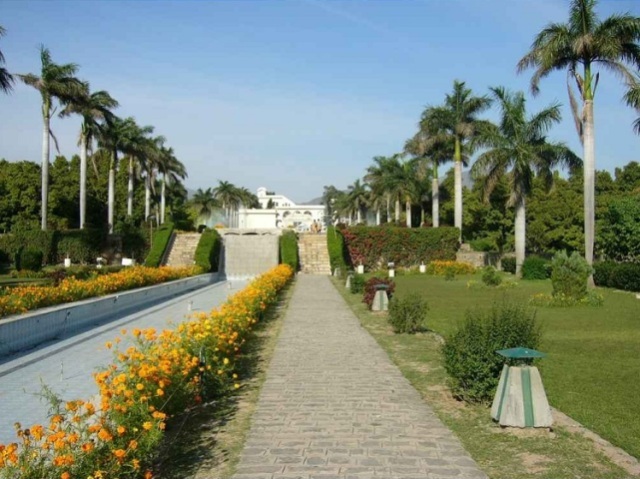 One of the most visited places in Chandigarh; the Capitol Complex is situated in Sector-1. It comprises of the Secretariat, the Assembly and the High Court. The geometrical concrete buildings of the complex, emerging elegantly out of the ground, comprise of the headquarters of the Government of Punjab as well as Haryana. ‘The Open Hand’ is one of the most impressive monuments in Chandigarh. Situated in the Capitol Complex, it comprise of a giant hand, rising 85 feet high from a hollow trench. Made of metal sheets, the hand is capable of rotating and delivers the message that the city gladly receives all, without any distinction. The most popular hangout of youngsters, Sector 17 houses the most upscale shopping market of Chandigarh. Apart from the market, the sector also prides itself on being dotted with fountains, sculptures and groves of trees. In short, it is completely a shopper’s as well as a pedestrian's paradise! The nature lovers will find the Sukhna Lake of Chandigarh perfect for them. Situated in Sector 1, the lake was created by building an artificial dam on a seasonal stream. Go for boating, relax in the restaurant situated there or just sit on the 2-km-long promenade and take in the beauty of nature. Rock Garden is perhaps the most frequented tourist attraction in the city. Being the unique garden that it is, the popularity is perfectly understandable. Situated near the Capitol Complex, it is spread over an area of around 12 acres. Built by Nek Chand, the garden comprises of art objects that have been made from urban waste material. Leisure Valley is for those who love soaking in the green surroundings. The valley basically comprises of a number of beautiful gardens, which adorn the city from its one end to the other. The popular Rose Garden of Chandigarh, the largest garden of Asia, is a part of the Leisure valley only. The popular gardens of the city are Garden of Tranquillity, Garden of Rare Plants, Garden of Annuals, Bougainvillea Garden, Botanical Garden and Garden of Aromatic Plants. International Dolls Museum, situated in Sector 23 of Chandigarh, has a vast collection of dolls and puppets from all over the world. It is open throughout the week, except Sunday. The other popular tourist attractions of Chandigarh comprise of Tower of Shadows, Geometric Hill, Martyr's Memorial, Museum of Evolution of Life, Government Museum and Art Gallery, etc. Chandigarh is one of the famous tourist places situated in North India. The numerous tourist attractions of the city, combined with its effortless charm, lure tourists here. Its closeness to the hill station of Shimla and Kasauli is another major plus. Hotels in Chandigarh cater to the large rush of the tourists visiting the city on an annual basis. Right from the luxury hotels to the economical budget hotels, you will find all types of accommodation in the city. Some of the most popular hotels of Chandigarh are The Taj, Hotel Maya Palace, Hotel Mountview, Hotel Shivalikview, Hotel Piccadily, etc. Chandigarh has a domestic airport of its own, connected with all the key cities of India. Simplifly Deccan and Indian Airlines operate regular flights to the city from Delhi. Chandigarh railway station has trains connecting the city with almost all parts of India. Shatabdi Express, Jan Shatabdi and Himalyan Queen are the best trains for reaching there from Delhi. Chandigarh is situated at a distance of hardly 250 km from Delhi. National Highways 21 and 22 run through it, making it easily accessible by road. You can easily get buses and taxis for reaching there from the nearby cities.